The chapter introduces the concept of policy gadgets that may be expressed as the combined use of computer simulations and social media in policymaking. Such a concept is exemplified by providing the description of an Italian campaign on telemedicine, launched by the regional government of Piedmont (IT) in the context of an international research project named PADGETS (www.padgets.eu). In addition, some preliminary results are presented, which are very encouraging. The use of such instruments in urban and regional policymaking may generate significant advantages in terms of conveying society’s inputs to policy makers, by providing them with a set of concise, fresh, and relevant data in a cost effective and easily understandable way. The soaring complexity at a social, political, and economic level that characterizes modern societies necessitates more sophisticated policy making processes. Governments are no longer in the position of having in-house sufficient resources, information or competencies to effectively respond to the complex needs and wants of an interconnected, fast-evolving and unpredictable global environment. It is thus of critical importance for policy makers to partner with society to quickly identify new emerging problems and find innovative solutions. In such a context, the rise of social computing has recently attracted significant interest from both the academic and the professional world. Web 2.0 and social media, in fact, represent a potential cornerstone in the field of public sector innovation, leading to more responsive, informed, open, transparent and collaborative forms of governance. In particular, the increased capabilities of Internet users to “organize without organizations” (Shirky, 2006), coupled with the birth of social networks, have spurred the birth of numerous virtual spaces where people express their political views, problems and needs. This provides an additional motivation for government agencies to organize their presence in the social media. However, despite the rosy expectations and fervent impulses coming from the scientific community, government’s consultations are struggling to take off due to the presence of notable difficulties in collecting, organizing, and making sense of people’s opinions. In spite of the unsatisfactory results of participatory initiatives launched over the first decade of the second millennium, one ray of hope comes from the observed trend towards “government 2.0”, an emerging concept which denotes a situation where canonical governmental boundaries are blurred, leaving room for opportunities to harness “prosumption”, i.e., a new model of information collaborative production, where formerly passive consumers participate in an active and ongoing way. 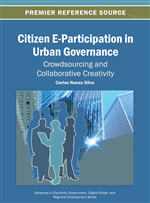 In this new paradigm, new modes of collaboration and co-creation surface and, therefore, pluralistic and networked forms of government become the dominant organizational model for service delivery and policymaking. This can be highly beneficial for urban and regional planning, taking into account its complexity, dynamism (rapid changes of context and needs) and multiple affected stakeholders. The aim of this chapter is to present the concept of policy gadgets and their role in the process of government transformation with respect to policy making and planning towards the above directions. In particular, it is analyzed how such instruments can be used by government agencies to inform and improve the policy making cycle. In order to exemplify how policy gadgets may be adopted in real life the chapter provides a description of an Italian pilot implementation launched by the regional government of Piedmont (Italy). The campaign focuses on a program for large scale introduction telemedicine solutions in the region of Piedmont for monitoring the health of some special patients’ groups. It aims to convey information on it to interested and affected citizens of this region (e.g. patients and their families, doctors, etc. ), and collect feedback from them, using social media. This campaign is conducted in the context of an international research project named PADGETS (its full title is ‘Policy Gadgets Mashing Underlying Group Knowledge in Web 2.0 Media’ – www.padgets.eu), partially financed as part of the ICT for governance and policy modeling objective of the seventh framework program of research of the European Commission. Including these introductory comments, the remainder of the chapter is structured in four sections. Section two presents some background information. Section three starts with introducing the concept of policy gadgets and subsequently follows on by presenting and discussing the Italian pilot on telemedicine. Then it places the research work conducted within a number of long-term socioeconomic trends and highlights some of the future challenges and research directions. Finally, section four contains some conclusive remarks about the potential of policy gadgets to transform policy making as we know it today.